New Jackson’s Row designs by architect Steve Hodder for controversial St Michael’s development have been on public display – nearly a year after the originals were first unveiled. 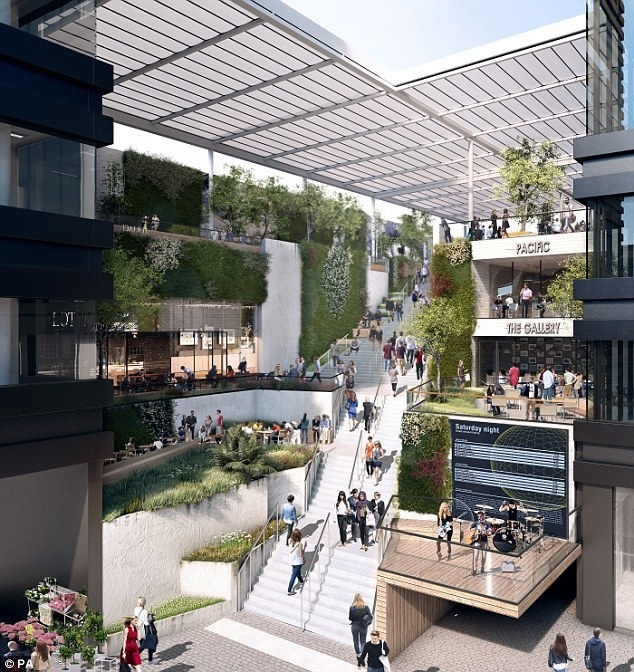 The project is for Footballers-turned-developers Gary Neville and Ryan Giggs. 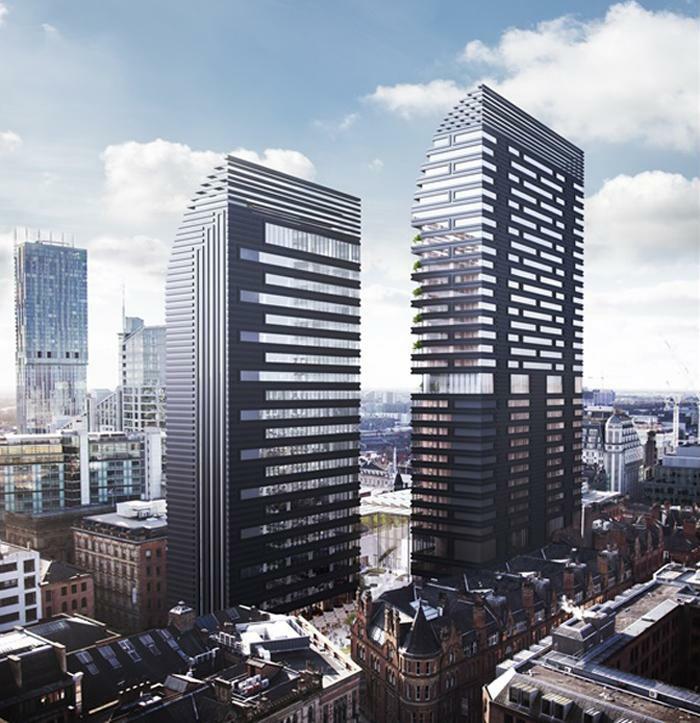 The new Jackson’s Row plans emerged just a few weeks after the scheme’s original architects Make (London) quit to be replaced by Hodder and Partners (Manchester). 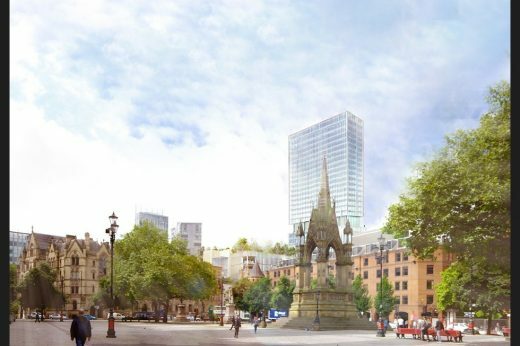 Drawn up by Hodder + Partners, the new designs for the reworked St. Michael’s proposal replace an abandoned twin tower designed by original architect Make. The new designs come just as the revised scheme goes out for its second public consultation. The latest images follow feedback from the first public consultation held in July. According to project backers, the St. Michael’s Partnership, the new designs change the configuration of the single 134.5-meter centerpiece skyscraper into a ”unique lozenge shape,” with a floating canopy supported by a three-story colonnade at the crown of the building. The Partnership added that the redesign’s extensive glazing and light bronze façade provide a ”more transparent approach” than the previous design. 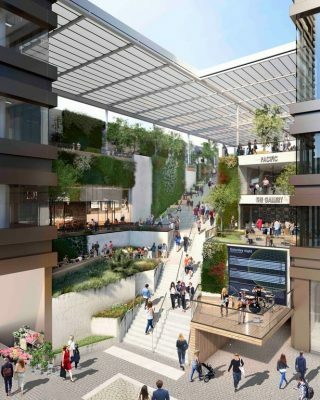 The project was then handed to Stephen Hodder, who had been brought in to review the mixed-use scheme in March, after both of Make’s previous attempts had received heavy criticism from local heritage campaigners. Changes to the reworked scheme include the retention of the historic Sir Ralph Abercromby pub and frontage of the Neoclassical Bootle Street Police Station, built in 1937. Both had been scheduled for demolition to make way for the Make-designed development, and in January the police station was included in The Twentieth Century Society’s top-10 list of buildings most at risk. 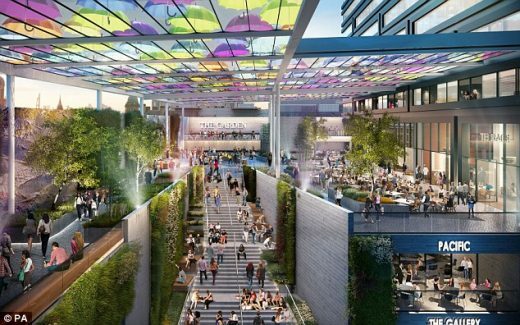 The revised scheme will create 13,657 square meters of office space, 2,973 meters of leisure space, 170 flats over 19 stories, and a 200-bedroom hotel over 12 stories. But the 1950s-built Manchester Reform Synagogue in Jackson’s Row is still earmarked for demolition, with a new synagogue to be built within the podium of the proposed tower block. 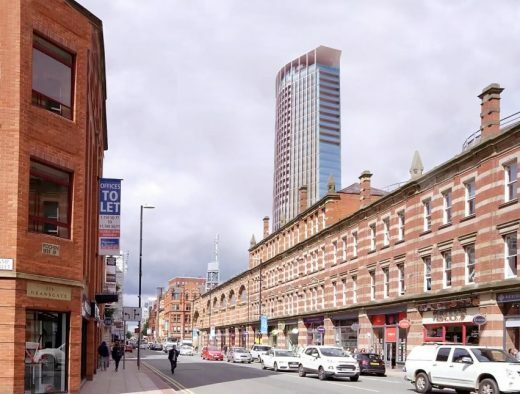 The height of the scheme has been reduced by 2 meters, and the tower’s footprint has been pushed to the western edge of the plot to be less obtrusive when viewed from St. Ann’s Square. The Spanish Steps-like valley that ran through the center of the original design has been dropped, with the ground-floor level significantly opened up. There will, however, be a new grand stair linking the development’s main hotel and residential skyscraper with the rooftop garden area of a lower nine-story office block. Final plans are expected to be submitted to Manchester City Council in September. 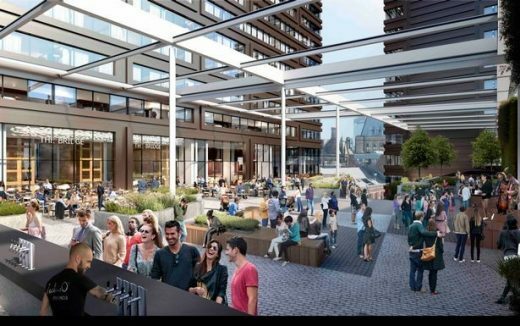 Manchester City Council has confirmed that Gary Neville and Ryan Giggs have asked for this major city centre scheme to be put on hold. Speaking at the MIPIM property fair (15 March), footballer-turned-developer Neville announced that he had asked the council not to consider the proposed St Michael’s development, so that it could be further refined. The Manchester United star turned property mogul announced he was prepared go back to the drawing board to address concerns. Talking to business and property chiefs at the influential summit in Southern France, Gary Neville struck a concilliatory note and said he was determined to get the £200m plan ‘right’. 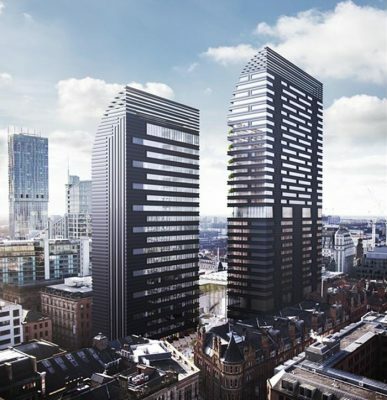 The scheme comprises two towers of 31 and 21 storeys on a central site near Manchester Town Hall. The proposals were submitted to Manchester City Council planners following two major public consultations. These had resulted in changing the colour of the towers from black to bronze. Ed. – I lived in Manchester for four years as an architecture student and then working my year-out at Michael Hyde’s in the Barton Arcade, so I know the city well, with many return visits and family in the area. So whilst not equipped with all the details this does look like a good quality scheme overall. Seeing the way the project has developed and listening to Gary Neville speak candidly from the heart in Cannes gives me confidence that the developers are serious in their aspirations. 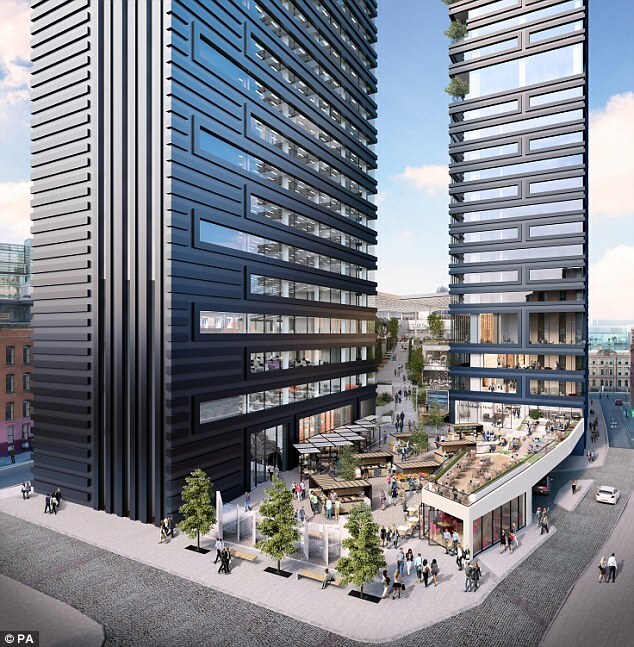 Make Architects have a strong pedigree in new-builds, though they have had their fair share of controversial schemes (like Broadgate expansion in London) which is typical of any large development in the UK and not necessarily reflective of their designs. The architecture is dramatic, especially the large stepped spaces with the supertall canopies. The asymmetrical design of the public realm with large level changes and bold architectural devices looks appealing. In terms of keeping the old buildings I do generally prefer architects to work with key older buildings. For example in Edinburgh the former Victorian school and Market St arches have been retained in the Caltongate scheme, which at first was destined to demolish the school. However the Bootle Street police station doesn’t look outstanding to me, nor do I recall any architects talking about it when I lived in the city or since. We need a balance and Manchester without the old warehouses on streets like King Street and Whitworth Street just wouldn’t be the same. But the city needs to live and breathe and that means it has to flex to accommodate the new, and if the new is of good quality then bring it on! A major development in Manchester city centre backed by well known footballers Ryan Giggs and Gary Neville has propelled the Reform synagogue from 1953 and the 1930s Bootle Street police station on to a list of buildings at risk, reports The Guardian. The top 10 has been created by the C20 Society, which campaigns for 20th-century architecture. Catherine Croft, the society’s director, said some of Britain’s most remarkable buildings were in danger of being lost as a result of development, dwindling budgets and short-termism which fuelled an “out with the old, in with the new” mentality. The synagogue building has “some of the earliest examples of figurative stained glass in a Jewish place of worship”, whilst the police station from 1937 is described as “a distinguished neo-classical building”, state the C20 Society. 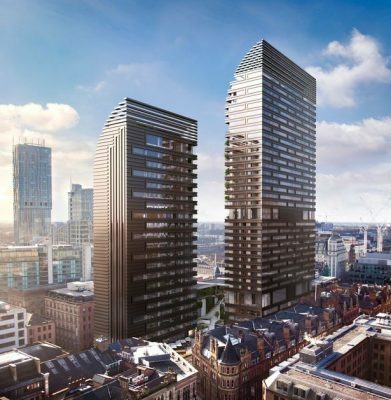 The Twentieth Century Society is objecting to a brace of towers planned in Manchester by Make for footballers-turned-developers Gary Neville and Ryan Giggs, describing the scheme as “shocking”, reports Building Design. The £140 m city centre site, originally known as Jackson’s Row but now called St Michael’s, will include a new synagogue, a five-star hotel, 153 flats and 13,000sqm of offices, plus some retail. Demolitiom is proposed for the Manchester Reform Synagogue, built in 1953, Bootle Street Police Station, built in 1937, and the Abercromby – a Victorian pub. The 20th Century Society has submitted an urgent application to Historic England to have the synagogue building listed. 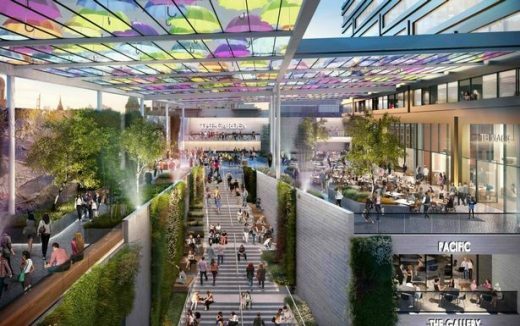 Former Manchester United football player Gary Neville has unveiled his £200m plans to demolish an entire city centre block to build two skyscrapers, a luxury five star hotel and plaza. 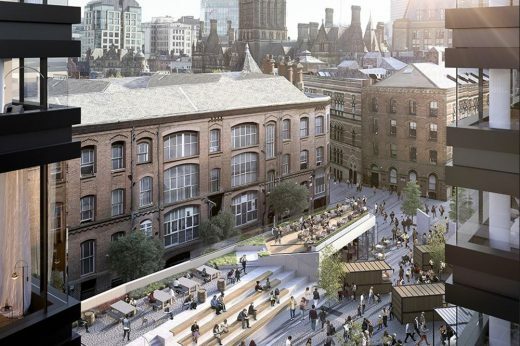 The proposal is to demolish the former Bootle Street police station, Manchester Reform Synagogue and Sir Ralph Abercromby pub on Jackson’s Row. 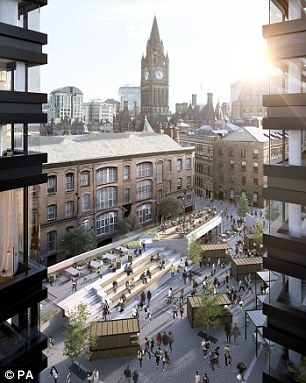 Gary Neville wants to create a new district between Albert Square and Deansgate, called St Michael’s. A new synagogue would be built, while it is understood a replacement for the Sir Ralph Abercromby could be incorporated. A planning application is due in September 2016, which will be subject to public consultation. If successful work would begin on site in 2017. It is understood Historic England is not impressed by the scale of the skyscrapers. 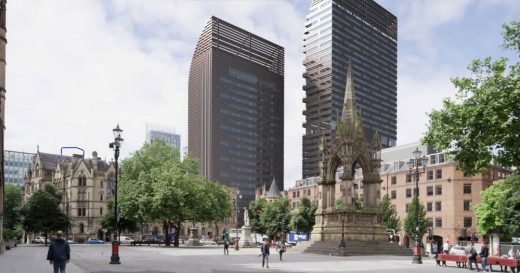 Two plazas are proposed, to be known as St Michael’s Gardens and St Michael’s Square. 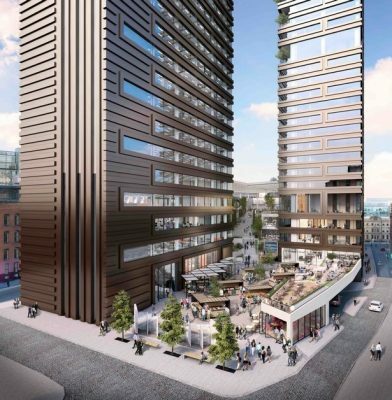 The most controversial aspect of the development is likely to be the demolition of the historic Sir Ralph Abercromby, said to have been the inspiration for the pub in TV show Life on Mars. CAMRA and other supporters had tried to get it protected using a community order and launched an online petition to save it. The 41-year-old was capped 85 times for England. St Michael’s is being backed by both Chinese and Singapore investors.